These beauty bars are packed full of ingredients to support healthy skin – inside and out! Calendula is herb with an affinity for the skin. 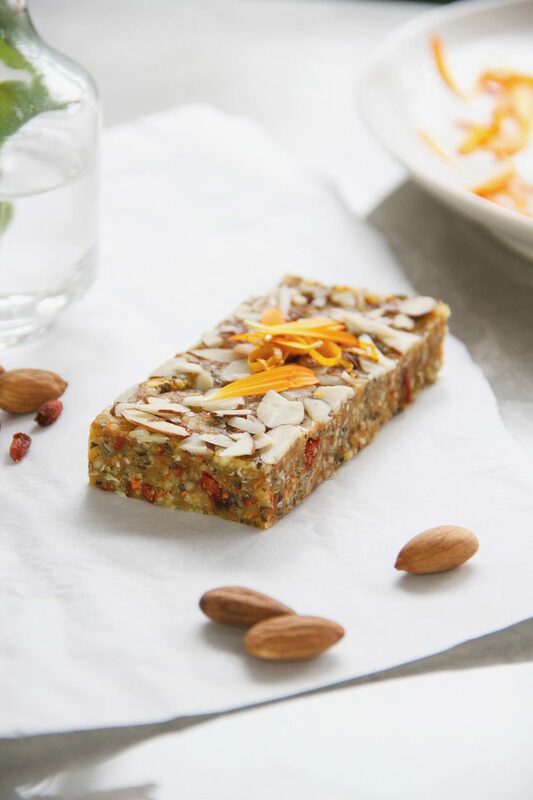 These raw bars are filled with their bright orange petals, in addition to anti-aging and antioxidant rich goji berries. A powerful combo! Continuing on with last week’s theme of natural remedies in your own kitchen – today I have prepared a simple recipe that uses a common plant from the garden – Calendula. Calendula is that happy, bright yellow orange flower also known as pot marigold. It is often planted to help attract the bees as well as deter pests. Calendula has her own special healing powers, a well known remedy for all kinds of problems associated with the skin, and it’s for this reason that calendula is a popular ingredient in many herbal creams. Calendula helps to soothe inflammation of the skin, and is helpful for eczema, psoriasis and acne. It is also good for wounds and physical injuries, as it has antiseptic and astringent qualities. Finally, not skin related but useful to know all the same, calendula can be used for gastro-intestinal problems. The plant’s astringent qualities enable it to draw skin and tissue together, making it great for ulcers, stomach cramps, and diarrhoea. All things bright red, orange and yellow tend to be good for the skin, they are rich in beta carotenes, the pigment in the plant that gets converted to vitamin A in the body. Vitamin A helps protect your eyes, can reduce wrinkles, improve wound healing, and soothe skin conditions. 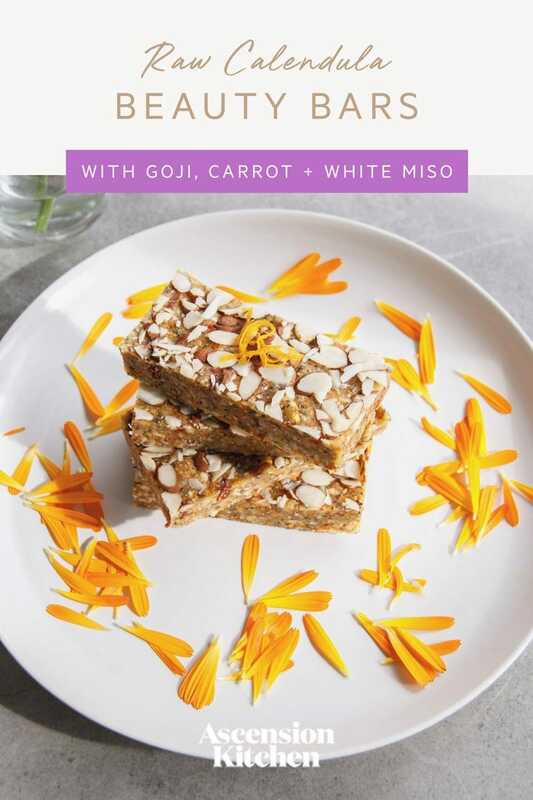 The carrots and goji berries in this recipe give us all of the above. 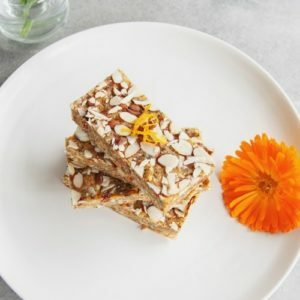 I used rice malt syrup to sweeten the recipe, but you easily sub it out for coconut nectar or pure maple syrup – Manuka honey would also be great (another good one for the skin!). White miso is in there because it sneaks in a little good bacteria, and lends a subtle salty taste. You could also run with the flower theme and sprinkle in some flower essences for some extra magic. Happy beauty bar making, beauties! 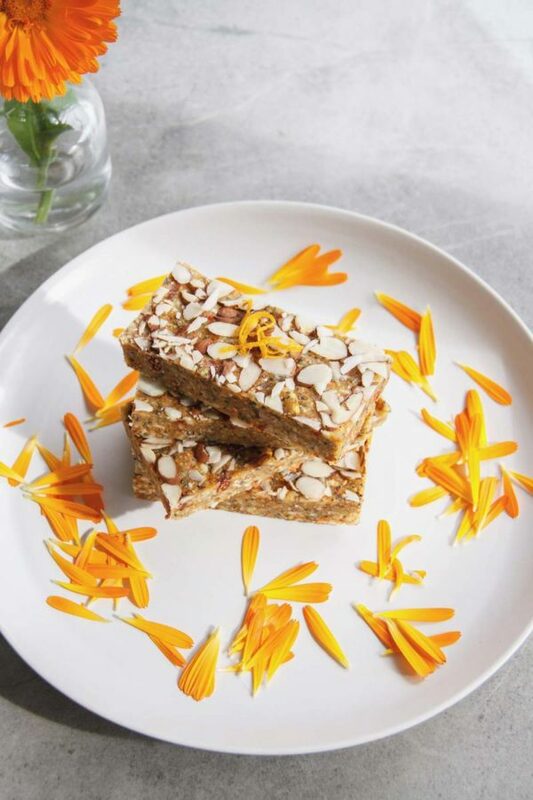 Raw bars filled with a myriad of ingredients that help promote healthy, glowing skin - notably - the herb calendula. Place the coconut butter and rice malt syrup in a jug, and rest it over a bath of hot water to soften or liquefy. Roughly blitz the whole almonds in the food processor, just a little – we want to have a few chunks in there. Add all other dry ingredients, except the flower petals and goji berries, and pulse till combined. Pour the coconut butter and rice malt syrup into the mixture, and add the vanilla paste, pulse again till combined. Add the flower petals and goji berries at the end for one final quick pulse. Transfer mixture to an 8 inch square cake tin lined with baking paper, use the back of a spoon to flatten the surface. Press slivered almonds over the top to decorate, and perhaps some extra orange zest. Freeze to set, cut into 8 large bars to serve.